In 2005, Dr. Mary Schweitzer shocked the paleontology community by reporting that she had found soft tissue in a Tyrannosaurus fossil that was thought to be 65 million years old. Since then, numerous other cases of soft tissue in dinosaur fossils have been reported (see here, here, here, here, and here, for example). Currently, the “record holder” for soft tissue is a worm fossil that is supposed to be 550 million years old! While such discoveries have been met with skepticism, the overwhelming evidence points to the fact that there is soft tissue in many fossils that are supposed to be millions of years old. Of course, the next obvious issue to address is the chemical makeup of these soft tissues. Are the large biomolecules that we expect to find in soft tissue there? Are they intact or severely decayed? After all, most proteins are expected to decay significantly in as “little” as 30,000 years. Despite this fact, some of these fossils contain what appear to be intact proteins. Now, of course, there is always the possibility of contamination. Fossil collection isn’t the cleanest of pursuits, and proteins are found pretty much everywhere on the planet. Thus, it is possible that the proteins which have been discovered in dinosaur bones aren’t really from the dinosaurs. However, two recent studies indicate that contamination cannot be the explanation. These proteins are real, and they really are from the dinosaurs themselves. The first study comes from Dr. Schweitzer herself. Over the years, she has been met with lots of skepticism regarding her revolutionary discoveries, so she is particularly eager to make it clear that the soft tissue and biomolecules her team has found are not the result of contamination. She and her team recently published the most convincing study to date. Essentially, they decided to excavate a dinosaur fossil with the specific intent of making sure there was no way it could be contaminated with biomolecules. First, they collected the fossil while it was still encased in the sediment surrounding it. They used no preservatives of any kind, and they only exposed the fossil once it was in a lab that was clear of all organic contaminants. The instruments used were also clear of contaminants. In this clean environment, they collected a sample from the femur (the large leg bone) and analyzed it with a mass spectrometer. They found eight sequences that correspond to collagen 1, a common protein found in animals but not bacteria. Two of the sequences match ones that have been found in other dinosaur bones, and six of them are new. They are all similar to sequences found in birds and crocodiles, which one would expect for a dinosaur. Given the painstaking measures used to avoid contamination, it is clear that this collagen really is from the dinosaur. Another study, done by researchers who aren’t affiliated with Dr. Schweitzer’s group, approaches the problem in a completely different way. They analyzed a dinosaur fossil that is supposed to be 195 million years old. 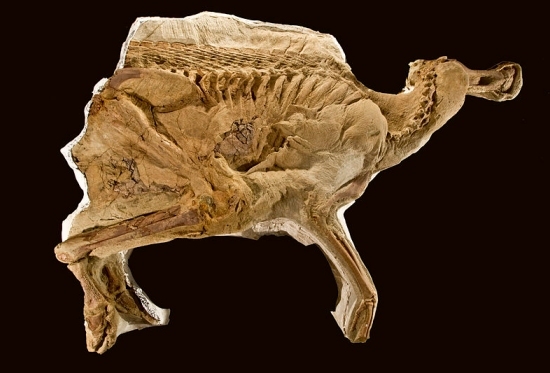 Rather than extracting tissue from the fossil, which could introduce contaminants, they took thin slices of the fossil and scanned them with radiation from the National Synchrotron Radiation Research Center in Taiwan. This allowed them to look for molecules in situ (in their original place). In the rib fossils, they found collagen associated with the blood vessels that supplied blood to the bone. There is essentially no possibility of contamination in this study, since the proteins were analyzed in the bone itself. Thus, it is clear that the collagen is from the dinosaur, despite the fact that the fossil is supposed to be 195 million years old. How could collagen be preserved for such a long time? They found a lot of iron in the fossil as well, probably from the blood of the dinosaur. They suggest, as Dr. Schweitzer has, that the iron somehow helped to stabilize the protein and keep it from breaking down. From a chemical standpoint, however, that’s not consistent with what has been found in other dinosaur fossils. I suspect that the most likely explanation for the wealth of soft tissue and intact or nearly-intact proteins found in supposedly ancient fossils is that the fossils aren’t nearly as ancient as most people want to believe. I read your blog once about the unlikeliness of birds evolving from a dinosaur-like creature related to what we know of how dinosaurs might have walked versus birds, among other things. I was doing a lesson with my kids on avian respiration – the complexity and efficiency of which is remarkable- and I was wondering if anyone knew much about the respiration process of birds vs dinosaurs and if that might further differentiate or equate the two. From what I have read avian respiration is unique in the animal kingdom and perhaps this could further separate birds from dinosaur ancestors. Thoughts? Also, is the feeble iron-rich preservation hypothesis still the only one they have for the remains of soft tissue? The comparison of dinosaur lungs and bird lungs is a bit murky, Tim, because it’s hard to learn a lot about breathing from fossils. Some fossil analyses (like this one) say that the respiration systems are simply too different for birds to have come from dinosaurs. Others (like this one) indicate that there are enough similarities that they could have. I really don’t think we know enough about dinosaur respiration to say one way or the other. As far as I know, the iron-rich preservation hypothesis is the only one that has been put forth with any kind of evidence. Awesome. I wonder what the response will be if DNA is found in any of these samples. If DNA truly has a 521 year half life then it seems possible in a young earth model. Do you think if DNA is found it will be enough to convince at least a few scientists that dinosaurs lived more recently ? They seem to think DNA is one of the most reliable and accurate half lives (at least for now). I suspect that any kind of molecular evidence (DNA or otherwise) will only help “tilt the balance” in the minds of those who are already beginning to question the consensus view. It’s too easy to claim that we don’t know enough about the chemistry of these biomolecules to rule out a millions-of-years lifetime, at least in some specific cases. Would you not consider those to be preserved soft tissue, or to be just preserved biologic material? As I understand that report, they found amide groups, which are functional groups within a protein. Thus, they discovered protein fragments, which could easily be the result of protein degradation. Of course, they could also still be part of an intact protein. It doesn’t seem like the researchers made the distinction. This is important, since functional groups are not nearly as complex as the protein in which they are found, so they can last much longer than the protein itself. Yes, but 1.8 billion years? Is that really reasonable? I really don’t know. While there has been a lot of work on the stability of proteins over time, I haven’t seen any work on the stability of specific functional groups over time. That’s exactly right, Joshua. Since there are scientific mysteries no matter how old you think the earth is, we all need to be humble with how we approach the issue! Appropriate, since it’s been a little over a year since you posted on his book, “Shadow of Oz,” which I still think is one of the best books on evolution out there. I agree that it is the best recent book on evolution. Points 1 and 2 in his post are spot-on. I am not crazy about point #3, because I don’t pretend to know the mind of God. Thus, I don’t see how someone can say that God wouldn’t create via a specific process. There were those in the early church (and those in ancient Judaism) who said that God wouldn’t create over six days, since that would effectively mean He isn’t very powerful. Thus, they suggested that creation was instantaneous, and the six days were an indication of priority. When you start assuming how God does things, you are likely to make a lot of errors! Early today, I read an article about the soft tissue, and it was said that the collagen Dr. Schweitzer found was very similar to what is found in chickens. They said that is ample evidence for the dino-to-bird evolution. How do you feel about that? It’s also similar to the collagen found in crocodiles, as this study shows. Thus, this isn’t evidence for dinosaurs evolving into birds, since crocodilians were supposed to have split from the common ancestor about 100 million years before dinosaurs are supposed to have evolved into birds.